The wide ranging work of the Southwell Brothers appears on a number of other websites, and there follows a list of sites of interest to anyone studying their work. Boning and Small in Hastings A survey by David Simkin of Boning and Small's work. British Columbia Archives Includes a copy of a Southwell Brothers photograph of the politician Frederick Seymour, who served as a Governor of British Columbia, 1864 - 1869. British Museum The British Museum collection contains a portrait by the Southwell Brothers of Prince Alamayu, son and heir of Emperor Tewodros II of Ethiopia, wearing American clothing. This portrait was donated by Mrs Perrin, niece of the Southwell Brothers. Photography and the Debenhams Part of the Debenham Family History website. Includes information on William Elliott Debenham (brother-in-law of William Henry, Frederick and Edwin Southwell) and his brothers Edwin and Arthur, as well as John Worley Debenham, son of Arthur, who specialised in theatrical photography. Luminous Lint Paul Frecker's photographic gallery on the "Luminous Lint" website. This includes a substantial collection of examples of cartes de visite by the Southwell Brothers. National Portrait Gallery The National Portrait Gallery in London has recently (9 May 2011 to 6 December 2011) held a special display entitled "The Southwell Brothers: Photographers Royal" in Room 26. See the What's On section of their website for more information. photoLondon "The Database of 19th Century Photographers and Allied Trades in London: 1841 - 1901", based on research by David Webb; website project managed by Mike Seabourne and Bob Pullen. It should be noted that this website is no longer being edited or updated. Royal Collection Trust The photographic catalogue of The Royal Collection Trust lists more than seventy photographic portraits of members of the Royal family by William Southwell, dated 1860–1862, and Southwell Brothers, dated 1862–65. Sophia Rogerson in Hastings A survey by David Simkin of Sophia Rogerson's work. University of Washington Library Photographs of the actors Charles Kean and Ellen Tree by the Southwell Brothers are held in the photographic archives of the University of Washington, Seattle. Victoria and Albert Museum The Victoria and Albert Museum has an outstanding collection of cartes de visite by the Southwell Brothers - the Guy Little Theatrical Collection, presented to the museum in the early 20th century. 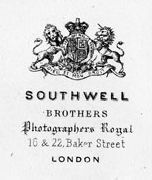 They can be seen in the on-line gallery on their website by searching for "Southwell Brothers".